« If You Like 24, You Will Love MI-5! If we make it to Sunday, Sherrylee and I will have been married thirty-nine years. It was a beautiful Easter Sunday April 11, 1971, in Fort Walton Beach, Florida. My best man—my brother Gary—got sick from the ham at the rehearsal dinner, so he was violently sick during the wedding and could not participate. This left us one groomsman short to walk out with the bridesmaids, so we replaced Gary with Joe Earnest–Sherry’s high school boyfriend—and a good friend to both of us then and now. Well, Joe didn’t have any dress shoes, having just come from the beach, so we borrowed Don Samanie’s shoes in an effort to make him my brother-in-law. He sat at the back of the church in sock feet throughout the entire service. These are the funny things. At little earlier that morning, my so-called friends Randy Bostic and Roger Lamb “stole” my car while I was at breakfast. Unbeknownst (a KJV expression from the 60s) to them, Sherry’s wedding dress was in the backseat of the car, so they had fun driving around and hiding from us—but Sherry wasn’t able to get dressed until they showed up again! She still hasn’t totally forgiven them for that! Sherry’s father Max, the preacher for the Ft. Walton church, was performing the ceremony. She and I had gone over all the do’s and don’ts with him. We did not want all the clichés, we did not want a sermon on marriage, we wanted something spiritual but personal, etc—typical kids of the 60s. He did a great job! He first addressed me personally and told me some things—which I hope I have practiced although I have forgotten what they were—but when he got to Sherry, his youngest daughter, he started with, “And, Sherrylee . . . and that’s as far as he got before he choked up. I love him for that. Our wedding party sang “The Lord Bless You and Keep You” as our recessional–of course, with the seven-fold AMEN!! Great reception with Aunt Grace playing the piano—and then we left—married—for thirty-nine years. I lost my wedding ring the next day in the ocean. We rushed out to buy another one at Edisons for $29.00! 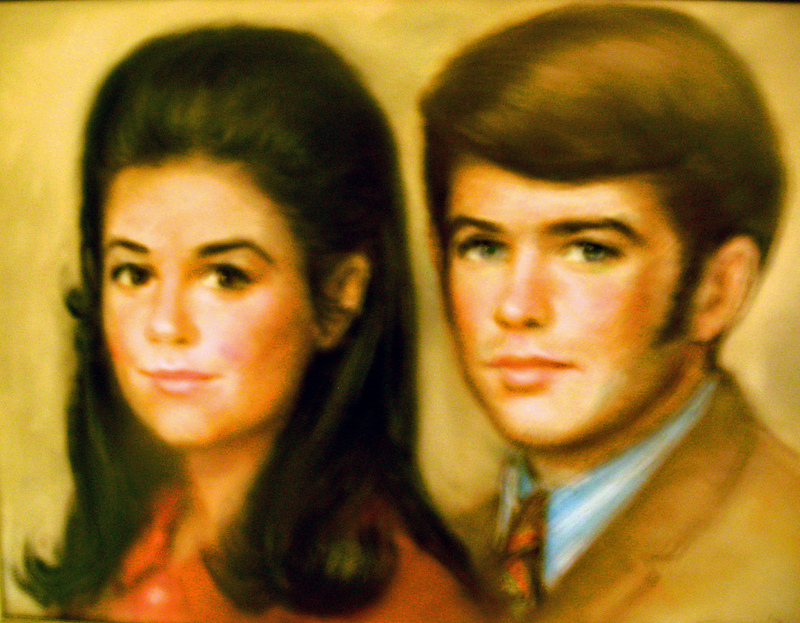 We had our portraits done in pastels in New Orleans on our honeymoon. When I look at that picture, which has always hung in our bedroom, I think of how young we were, how innocent about life—but how thankful I am that God created our marriage in heaven. A good marriage is a gift from God. Well, thank you for letting me share a nostalgic moment with you. Maybe I’ll be more reflective later, but right now it feels good just to smile. Congrats, Mom and Dad, on 39 years!! You have always been a great example of love and commitment. Thanks for showing us and teaching us that a strong family starts with a strong marriage! CONGRATULATIONS ON A GREAT DECISION TO MARRY AND STAY MARRIED – GOOD EXAMPLE TO ALL WHO KNOW YOU! SOUNDS AS THOUGH YOU HAVE HAD SOME GOOD FRIENDS THROUGH THE YEARS! SINCE I’M THE ONE WHO PERFORMED THE CEREMONY FOR OUR THREE KIDS – TWO DAUGHTERS AND A SON, I CAN WELL UNDERSTAND YOUR FATHER-IN-LAW CHOKING UP! HE’S OBVIOUSLY A GOOD MAN AND LOVES HIS DAUGHTER. AGAIN, CONGRATULATIONS AND MANY MORE YEARS WITH THE LOVE OF YOUR LIFE! DAVID (ENJOYING 56 YEARS OF MARRIAGE)!